In the fourth Ozark Ghost Hunter mystery, a ghostly visit from her former landlady draws Emma away from sleepy little Hillbilly Hollow to investigate a murder in the big city. 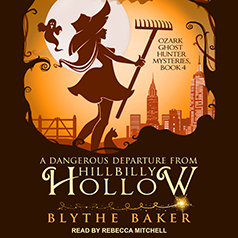 There's a new ghost in town—and it's calling Emma away from Hillbilly Hollow. A ghostly visit from her former landlady draws Emma away from sleepy little Hillbilly Hollow to investigate a murder in the big city. But what seems like a straightforward case soon becomes entangled with an event from Emma's past and a personal quest for justice. With the attractive but bungling Sheriff Tucker at her side, will Emma be tempted by the chance to avenge an old wrong? And will the glamour of city lights make her forget her friends and a certain handsome doctor back home?